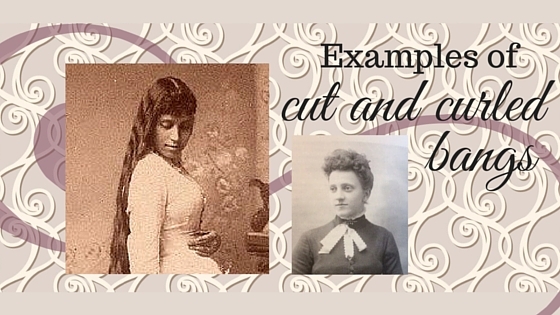 Women of the Victorian American Era seldom trimmed their hair. Yes, the curls about the face became stylish in the later part of the century and ladies curled these cut fringes with heated irons. But when it came to the vast majority of the hair upon their heads, it was considered their “crowning glory” and never to be cut. It’s not surprising that by the time adolescence gave way to adulthood, hair had become too long to wear down, resulting in various up-do’s. 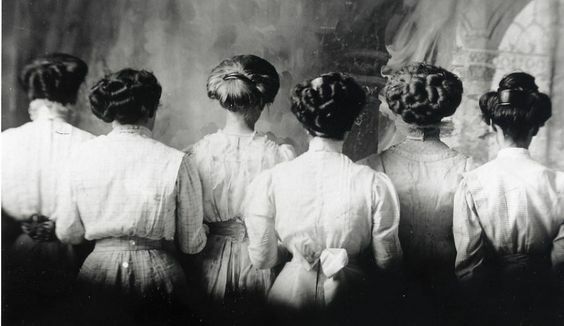 Victorian (and Edwardian) hair up-do’s of six women as pictured from the back. Image from rapunzelsdelight.com and Pinterest. The waves visible in most of the unbound, long hair in the various images is resultant of wearing in a braid while sleeping. Having had uncommonly long hair myself, I’m the first to recognize this braid-to-sleep strategy as a necessity to keep from twisting up in it, catching it on the bed frame, or a bed partner (little sister, husband, etc.) pinning it beneath themselves in sleep. 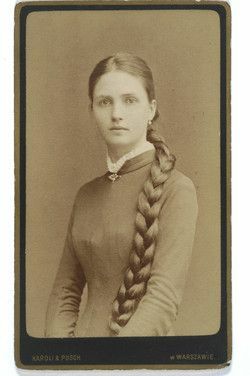 Victorian long hair braided and resting over shoulder. Cornelia Edith Yoï Crosse (1877-1944) – British Writer & Model. Photograph, circa 1900. 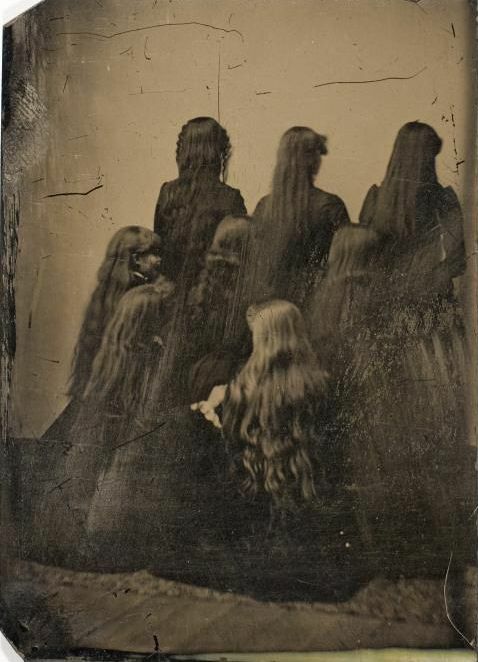 Backs of 8 unidentified women, circa 1880. Tintype, from International Center of Photography. 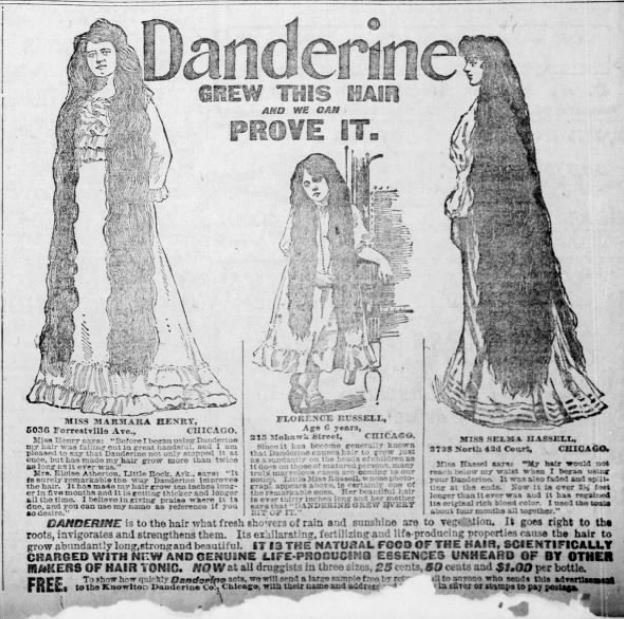 Women valued their hair so very much that medicines were peddled expressly catering to the vanity. Advertisement for Skookum Root Hair Grower. 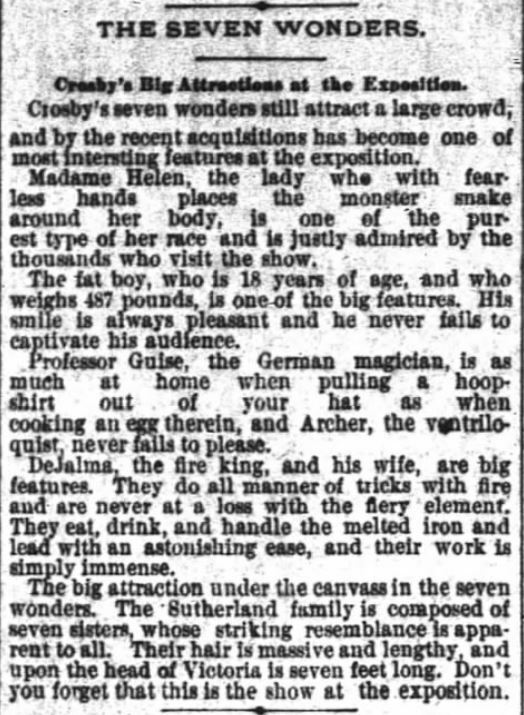 The Ogden Standard Examiner of Ogden, Utah on 20 September, 1891. The Atlanta Constitution, of Atlanta, Georgia on 8 November, 1881. But in all fairness, it appears that wide recognition of the dangers of casual use of cocaine didn’t become well known until the mid to late 1880’s. St. Louis Post-Dispatch of Saint Louis, Missouri, on 29 May, 1904. MISS MARMARA HENRY, 5036 Forrestville Ave., CHICAGO. MISS SELMA HASSELL, 2728 North 42d Court, CHICAGO. 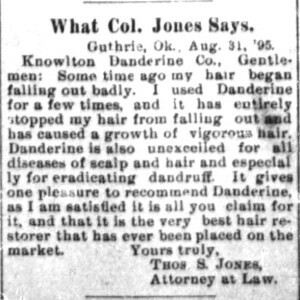 Testimonial advertisement for Danderine appeared in The Guthrie Daily Leader of Guthrie, Oklahoma, on 29 September, 1895. One of the Seven Sutherland Sisters, image from Pinterest. 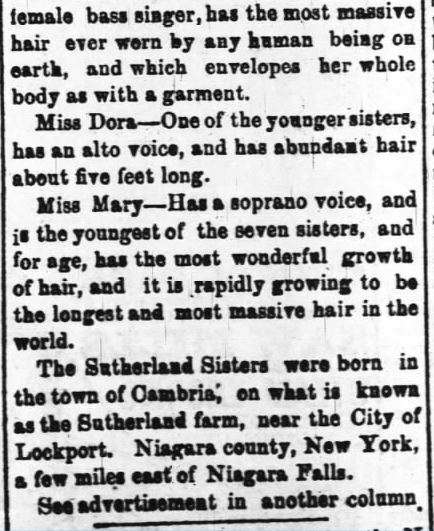 The seven Sutherland Sisters were traveling vocalists of great reputation, known for their unbound, flowing silken tresses. 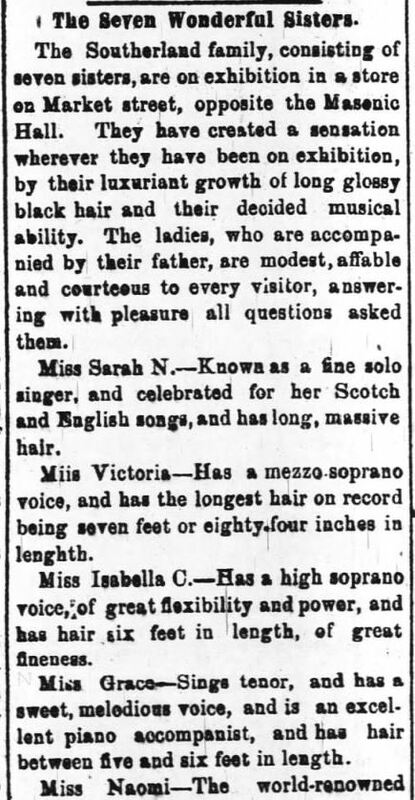 The sisters often appeared not only as performing musicians but as parts of circuses, on display for their magnificent hair (which other women must have coveted and perhaps men found ridiculously appealing). 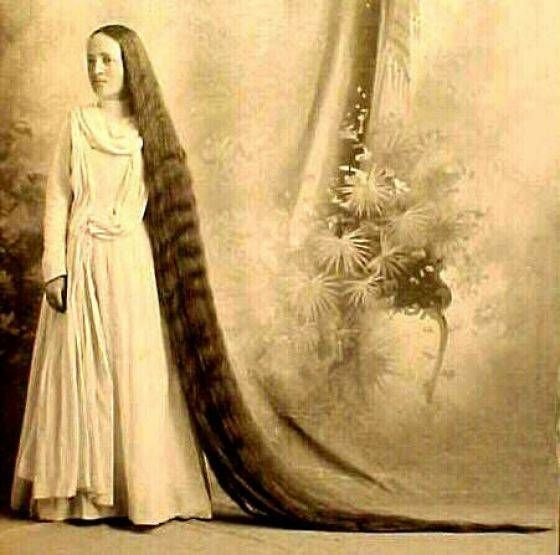 One Sutherland Sister, Victoria, was touted to sport hair a full seven feet long. The next closest sister’s hair measured six feet. According to The Atlanta Constitution of Atlanta, Georgia, on 22 December, 1881, the sisters were “the big attraction under the canvass in the seven wonders at the exposition”. 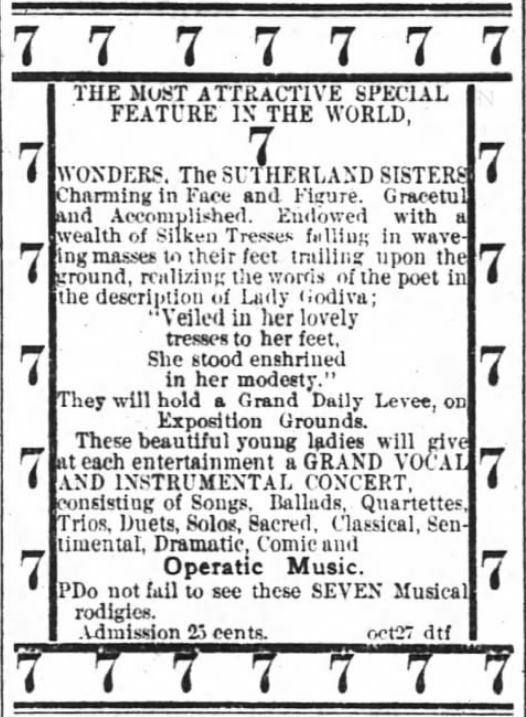 Seven Wonders: Sutherland Sisters, in The Atlanta Constitution of Atlanta, Georgia, on 22 December, 1881. 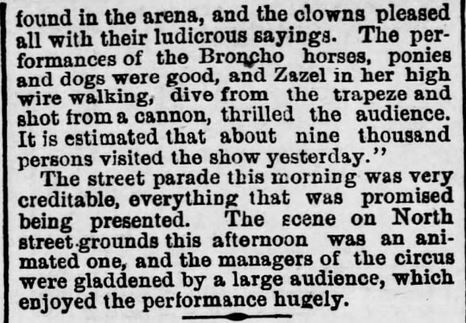 The Daily Review of Wilmington, North Carolina, on 27 March, 1882. Sutherland Sisters, Part 1. 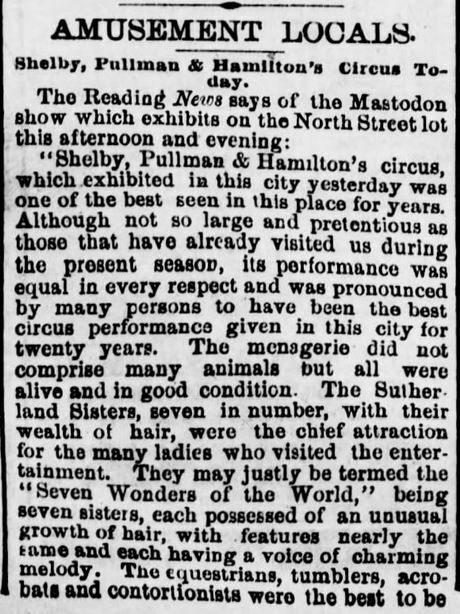 Harrisburg Telegraph of Harrisburg, Pennsylvania on 26 July, 1881. Sutherland Sisters, Part 2. Harrisburg Telegraph of Harrisburg, Pennsylvania on 26 July, 1881. The Atlanta Constitution of Atlanta, Georgia, on 29 October, 1881. 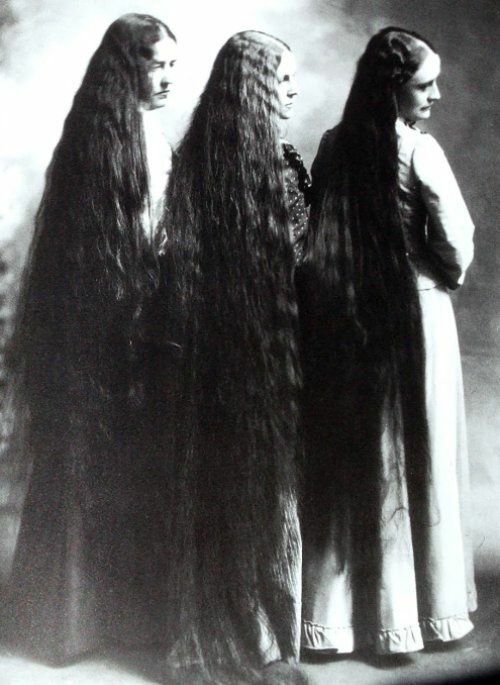 Three Victorian Women with long hair, from retronaut.com and Pinterest. Victorian woman’s hair drags way past her ankles. From typesofYoga and Pinterest. 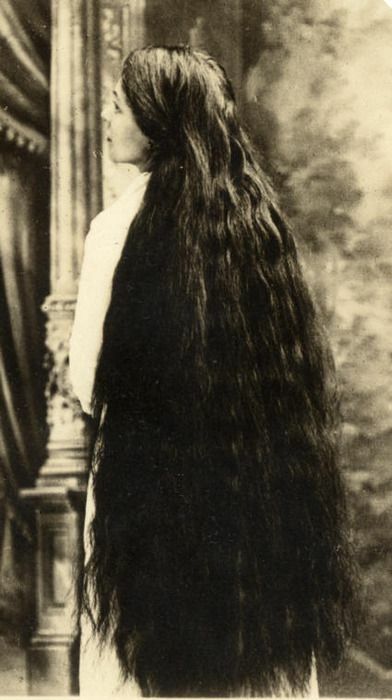 Victorian woman with very dark long hair. Black-pool Tumbler and Pinterest. 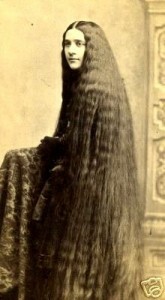 Image of Victorian woman sitting, displaying long hair. Longhairloom.com and Pinterest. 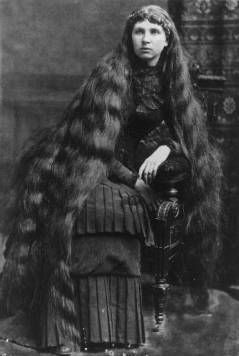 Victorian Long Hair. From Flicker and Pinterest. Izabella Potocka Lwow, circa 1880. 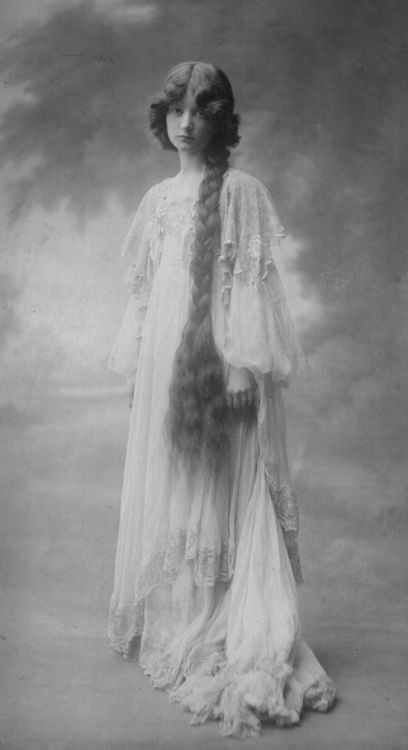 Victorian poses to display her long hair while wearing nightgown. Rapunzelsdelight.com and Pinterest. 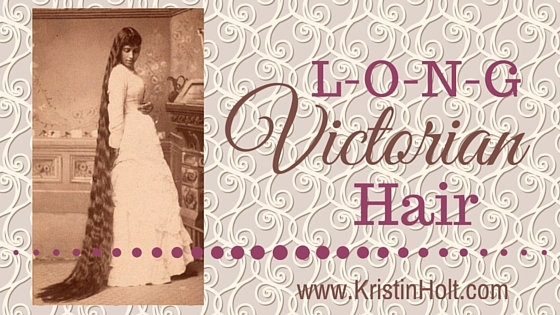 What is it about the long hair or hairstyles of the Victorian Era that interests you? Any thoughts to add? No wonder they only washed it once a week! Can you imagine how heavy it must be when wet? You’re right…long hair is not only difficult to wash but takes forever to dry (and untangle). I can tell by your knowledgeable comment that you’re experienced =). Laura Ingalls Wilder wrote in one of her books (These Happy Golden Years, I think) that she plaited her hair (braided) and could sit on the braids. I do remember something like that, having loved every Laura Ingalls Wilder book (and the TV shows) in my youth. 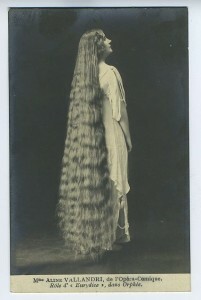 Long hair was the standard then and it’s so uncommon now. Thanks for dropping by and reminding me of a favorite long-haired woman. Very interesting article, Kristen. 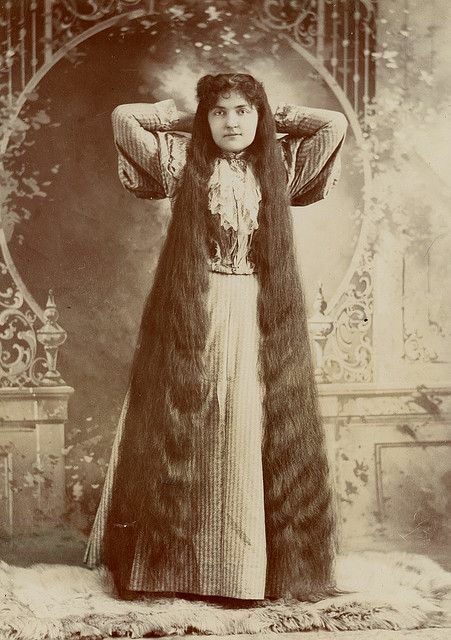 I can’t imagine wearing my hair that long. In high school when it was just past my shoulders was long enough. 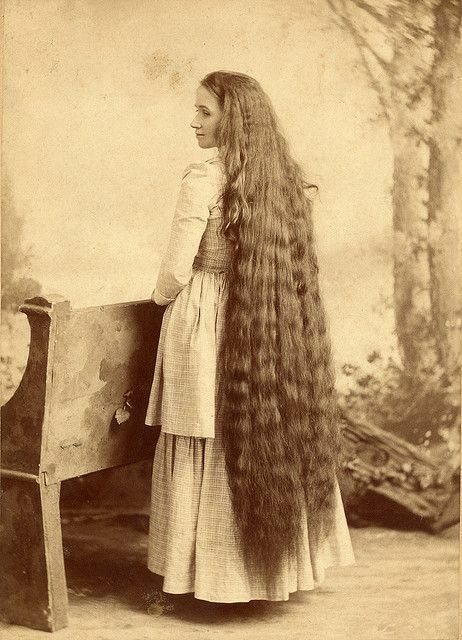 The time involved in braiding it and brushing it out each morning must have been part of the reason women rose before sunup. Thanks for the informative article. 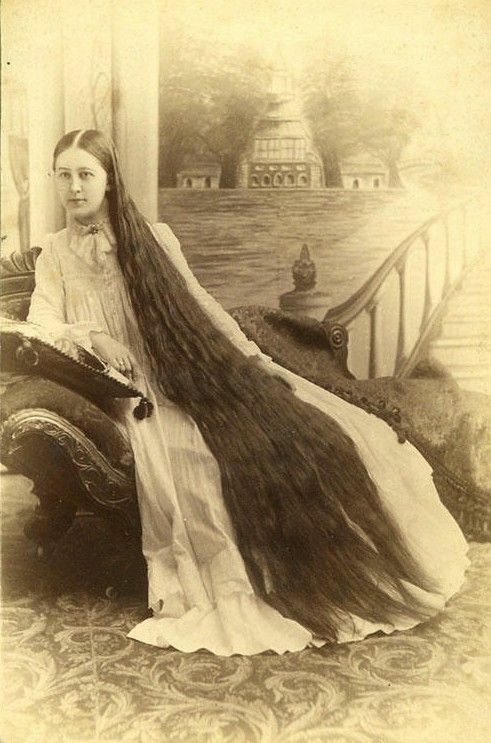 You’re so right; long hair is so much work. I can imagine the social expectations affected many women’s choices and they went along with it. =) Many thanks for stopping by and sharing your personal experiences and thoughts. It’s terrific hearing from you. What a wonderful post, Kristin. As a little girl, I had braids I could sit on (I was a big Laura Ingalls fan, too!) I had long hair for a very long time and can relate to the work involved with the upkeep. It’s so fun to see those old photos! Thank you for sharing them. Thank you for stopping by and sharing your own experiences with and love for long hair.